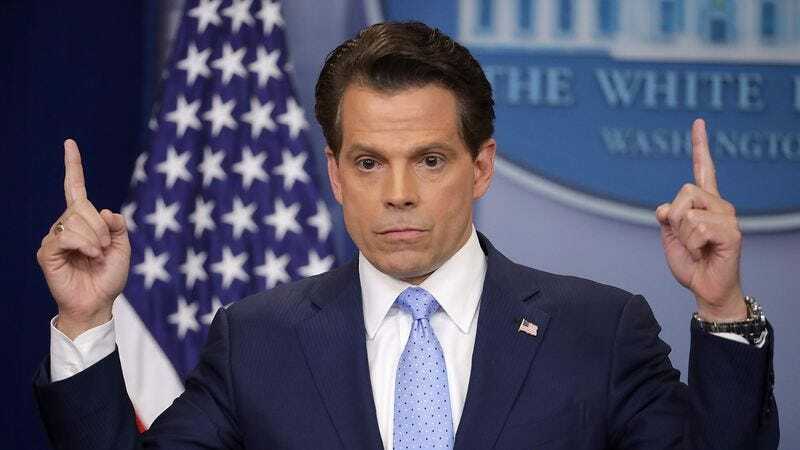 Although he’s now been out of the job for more days than he was ever in it, we still have some lingering run-off fascination with former White House communications director Anthony Scaramucci, a man who managed to have what we can only imagine Donald Trump would call “the greatest, the most amazing, the biggest” flame-out in recent Washington history. Happily, we’ll be able to get another distracting dose of Vitamin Mooch next Monday, with Stephen Colbert announcing that Scaramucci will be that evening’s guest on his CBS Late Show, presumably the better to update us on Reince Priebus’ mental health and the status of Steve Bannon’s self-improvement technique. Honestly, we’re not sure what to expect from the interview; other than a few promises to emerge from the darkness like some sort of vitriol-spraying Xenomorph, Scaramucci has been on best behavior since his resignation/firing. And we can’t imagine Colbert—who ironically serenaded The Mooch when “the frontstabber got backstabbed”—pushing him too terribly hard, either. (That being said, we can still keep our fingers crossed for another post-interview rant-fest to pop up, like the one that essentially ended Scaramucci’s White House career and sent him streaming, like a beautiful, profanity-spewing, Entourage-loving comet, through the Washington D.C. sky).